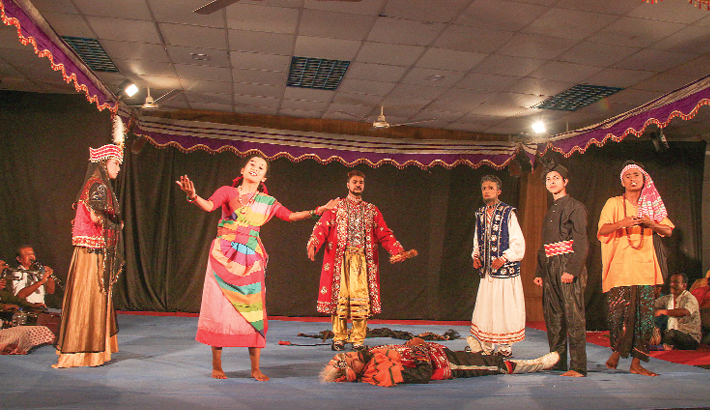 Students of Drama department at Jagannath University (JnU) staged ‘Ganga Theke Buriganga’ - a famous Jatra Pala - at its central auditorium on Thursday. Directed by Milan Kanti Dey, the Pala was written by Shanti Ranjan Dey. The story went six centuries back, during the reign of Sultan Shamsuddin Illias Shah in Bangla, while Emperor Feroz Shah used to rule Delhi. Through the story of the Delhi emperor's defeat at the hands of the brave patriotic ruler of Bengal, which took place some 650 years back, Ganga Theke Buriganga depicts the Bengalis urge for sovereignty. Moreover, the Pala addresses the issue of imperialism in a contemporary manner. It features the approach of an imperial ruler towards the people of a smaller country. Milan Kanti Dey, who directed the Pala, presented every segment of the traditional Jatra Pala such as the dance by the princes, comic relief and the appearance of ‘bibek' (conscience) in an effective manner in the Pala.